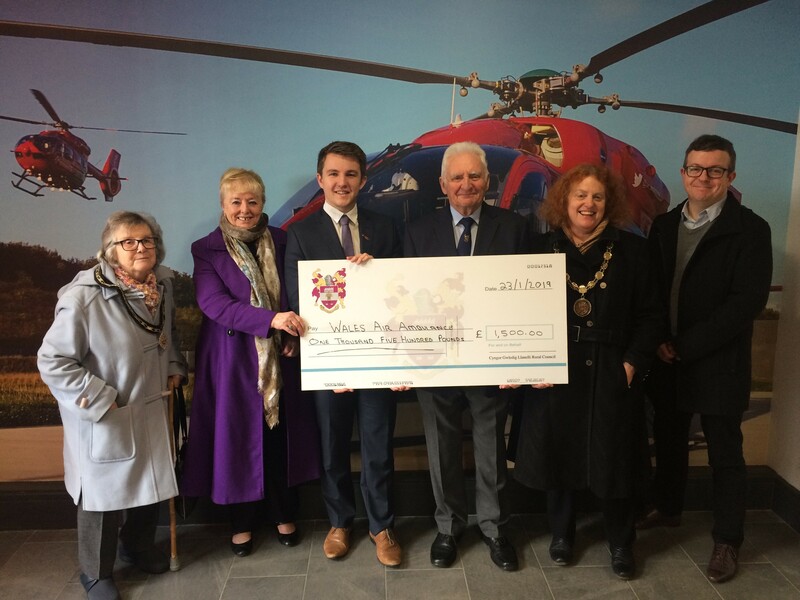 As Llanelli Rural Council continues to support good causes like the Air Ambulance, Chairman of the Council, Cllr Sian Caiach along with the Council Leader, Cllr Tegwen Devichand, presented a cheque of £500 to the Children’s Wales Air Ambulance and a cheque for £1,000 to the Wales Air Ambulance at their Dafen Airbase on Wednesday 23 January 2019. Wales Air Ambulance airbase staff and volunteers gave the members an informative presentation on the work done by the charity. The Dafen airbase, which covers South Wales, is one of four airbases in Wales and this coverage means that an air ambulance is only 20 minutes away. The air ambulance is kitted out with state of the art equipment which effectively takes an accident and emergency department of the hospital to the scene of an accident. The charity solely relies on fundraising and had over 3,000 missions in 2018, which was their busiest year on record. The Wales Air Ambulance is dedicated to serving people in Wales. They are on standby every single day of the year, ready to help anyone during their most difficult hour. The Children’s Wales Air Ambulance is a specialist division of the charity as the youngest patients need a different range of treatments. This service provides expert care required for paediatric and neonatal patients who need air support.